Small Mouth Sounds is a play about communication; it is also a play done mostly in silence. 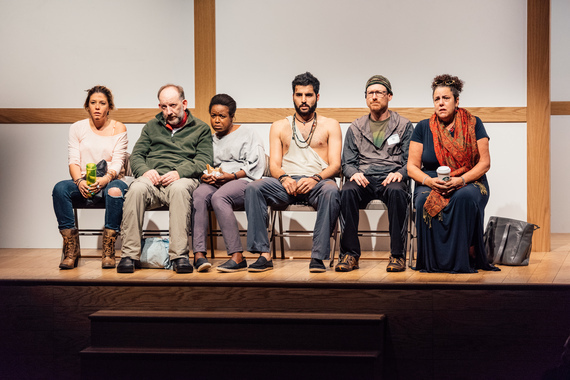 There is some dialogue, although it is generally against the rules at the upstate New York spiritual retreat where the play takes place. Silence, though--as theatricalized by Wohl (American Hero) and director Rachel Chavkin (The Great Comet, The Royale)--is golden. Four solitary strangers and one couple have come to commune in the woods under the instruction of an unseen moderator (Jojo Gonzalez), who soft-talks them over a loudspeaker. The various interactions are perhaps more aggressive than soothing, but that is the playwright's point. What makes the play remarkable is that so much of this is expressed without words, or with minimal dialogue. Sitting there in the rectangular space transplanted from Ars Nova to Signature's Romulus Linney Courtyard Theatre--with three rows against either wall, and a capacity of about 160--we slowly absorb the inner workings of these diverse characters. Marcia DeBonis (as the needier part of the couple), Babak Tafti (as a yoga instructor) and Brad Heberlee (as a sad sack of a loser) recreate their roles; they are joined by Max Baker (as the altogether silent attendee), Zoë Winters (desperately clutching her Trader Joe's bag) and Quincy Tyler Bernstine (as the other half of the couple). Ms. Bernstine gives the most penetrating performance as the seemingly strongest and most assured of the group, although we glean early on that she is seriously (or fatally) ill. DeBonis, meanwhile, is giving what might be an even better performance than before; from her very entrance, she seems weighed down with inexpressible anguish. Small Mouth Sounds is a play unlike any other, yes; but Wohl and Chavkin bring you right into the drama, and it makes an engrossing and pretty much delightful evening of theatre. 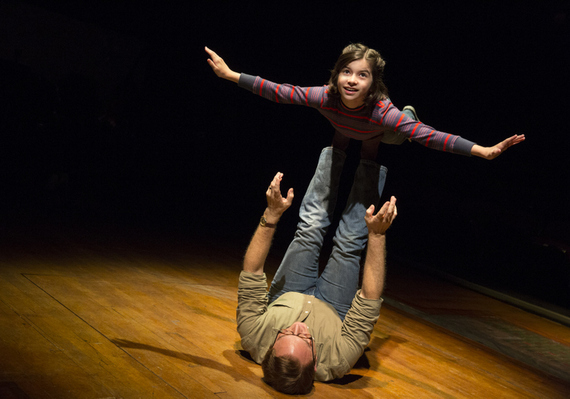 Fun Home--which I unhesitatingly considered an instant classic of the American musical theatre when it first opened at the Public in September 2013, and which was even better when reconfigured for the Circle in the Square in April 2015--is now entering the final weeks of its Broadway run (through September 10). A year and a half is not a significant run, at least compared to the likes of Phantom, Les Misérables or Chicago; but for a musical with cutting edge social significance and untold joys that might be seen as subversive to a fair portion of American consumers, it has done marvelously well. For the investors, yes, who received their money back in a swift eight months; but more importantly, authors Jeanine Tesori and Lisa Kron have triumphed with what has to be considered "difficult" subject matter. For starters, we are told early on that the leading man will kill himself before the final curtain; what's more, no sooner has the heroine/narrator introduced us to her traditional (?) small-town American family than she adds that she's a lesbian and her father a closeted homosexual. Seducing minors, too. Despite this--or, perhaps, because of this--Fun Home is a monumental piece of art (if we want to sound lofty) or a charmingly refreshing crowdpleaser loaded with laughter and tears (if we don't want to sound lofty). The show will hit the road beginning in October in Cleveland, and will visit all the usual spots (including Chicago, St. Louis, Detroit, Minneapolis, Las Vegas, Denver, L.A., San Francisco, Pittsburgh and Washington; and that's only the first eight months.) Audiences nationwide will hopefully embrace this show, which deserves to be embraced. Fun Home is not about the gay characters, or the suicidal father; it's about people and love and family--accompanied, mind you, by one of the most impressive scores of the century thus far. This is one of those "don't miss it" musicals, the sort that you'll want to see and you might well want to see again. There are, at this writing, nine weeks left at Circle in the Square. A visit last week demonstrated that Fun Home is as powerful as ever. The cast doesn't play it like actors gliding towards the end of a happy, long run; they are right into the material, giving the essence of "this is happening now for the first time" with honest-to-goodness, unforced lumps in their throats. The original cast is intact with the exception of the children playing Small Alison and Christian, who have aged out. The central role of Small Alison is now played with flair by the enchanting Gabriella Pizzolo, a former Matilda. Of the others, Judy Kuhn and Michael Cerveris remain incomparable, while Beth Malone demonstrates an even stronger link to the audience. 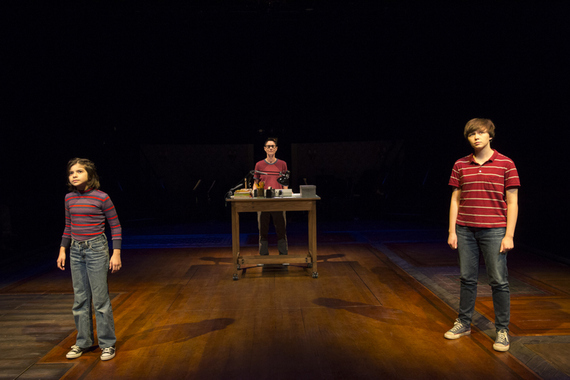 My aim, on returning to the show for a fourth visit--the first without the full original cast--was to learn whether Fun Home was still as brilliant and emotionally wrenching as formerly. The answer is a resounding and overwhelming yes.